What a beautiful post Judith. I’m so glad your trip brought you so much joy. Reading along I felt as though I was there with you. What an incredible experience. What a beautiful post. Should I travel this is the experience I would want. What you gained in opening your heart and mind to the people of Morocco I am sure will stay with you forever. I feel the bittersweet connection you made with the women in your sensitive description of their daily lives. Ii hope you stay in touch! This post exemplifies what I most hope for when I read or hear travel stories: a full-hearted, articulate recounting of the traveler’s interactions with the people s/he has encountered, and the traveler”s thoughts and feelings about those people and interactions. Bravo, Judith, for traveling the way you did and for the wonderful way your are writing about it. 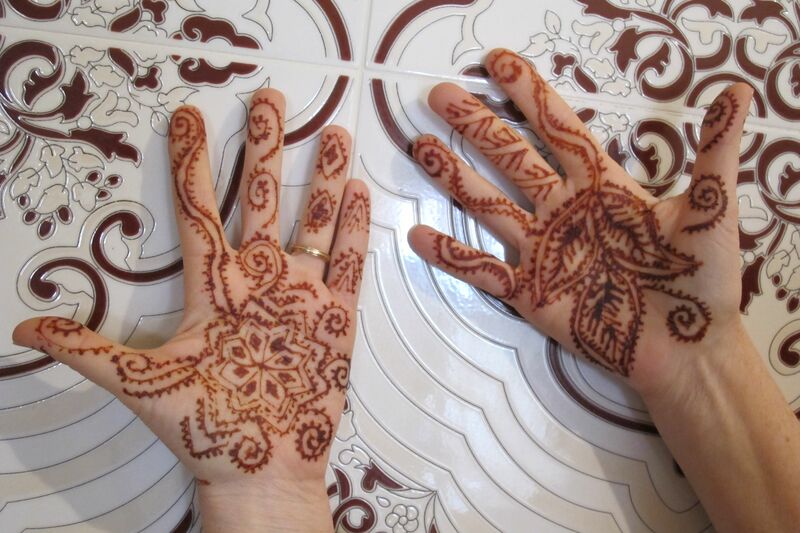 That you became part of a sisterhood during your visit is a tribute, in part, to the kind of traveler you were: open, curious, interested, non-judgmental and respectful enough of local custom to cover your body except for hands, feet and head. You and Paul must have nurtured those traits in Karsten, given how highly he is regarded by the people with whom he works and lives. His, and your, time in Tinghir not only has helped “promote better understanding of other people on the part of Americans” (Peace Corps mission), but also has helped promote better understanding of Americans by other people. 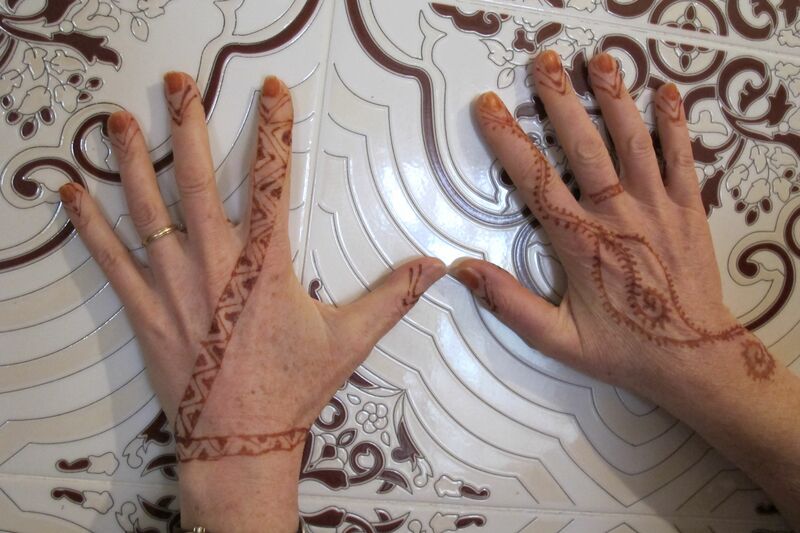 The henna decoration on your hands is a beautiful symbol of the sisterhood you share with the Tinghiri women you spent time with. May it last forever in your memory. What a great piece! You present a complex picture of Moroccan women, one that most Americans don’t get a chance to see. The hijab is a choice for some and not for others–but it is also a marker of religious and national identity. A Muslim women should never be reduced to the fact of the head scarf, because that, in itself, explains nothing. But your capsule portraits of the Moroccan women and girls who you met gives them each their own spirit and spark. Thank you everyone for your thoughtful comments. This was, indeed, the trip of a lifetime and I feel so lucky that the people we met were so open and interested in getting to know us as well. The trip has also changed my perspective on travel and will impact how I approach any trips to come. I am glad you enjoyed the Moroccan Experience in Southern Morocco! Your post reminded me of my childhood and all the places I visited while I was growing up in Ouarzazat. Thank you for stopping by! Yes, I loved my time in Morocco. Our son would like us to come back before his service there ends next spring. Even though its not likely we will return, the generosity of the Moroccan people will stay with me forever. Very nice. I was also a Volunteer in Morocco from 2004-2006 in a small village outside of Marrakech. Your son will have many ups and downs but he will be forever grateful for the experience. I’m so happy you were also able to benefit form such a rich experience. I wish you and your son the best of luck. Oh my, Elbert — am I just seeing this now? Thanks so much for commenting and for your good wishes. Yes, there have been many ups and downs. Being the only American can sometimes be isolating, but we are able to communicate easily with video chats, which is nice for all of us. Very different from the early days of Peace Corps where letters arrived every 6 weeks or so.